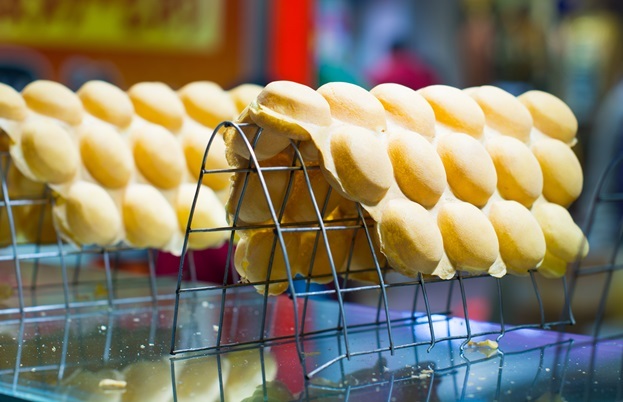 Discover Hong Kong's vibrant street food scene, known to many as the true spirit of the city. From sticky egg tarts to iconic curry fish balls, this is enough to give anyone wanderlust. 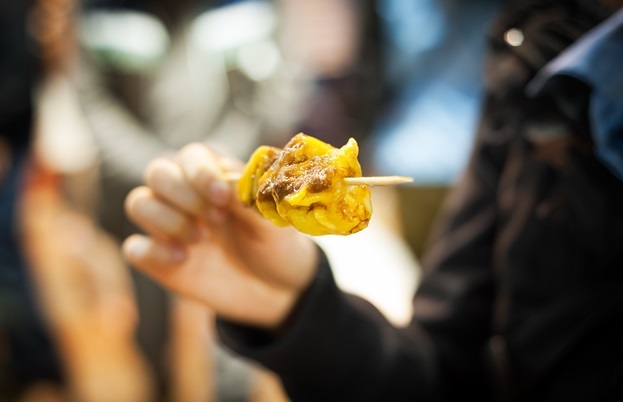 One of Hong Kong’s unique sensory experiences, the street food carts – or dai pai dong as they are known locally – embody the spirit of the city. A place where smartly dressed office workers, suit sleeves rolled up to beat the heat, eat alongside labourers and tourists in search of a cheap, filling lunch or dinner. Enjoy the relaxed, buzzy atmosphere of fold-away seating and shared tables, sitting outside among the tall buildings, people watching to your heart’s content. The dai pai dong are central to the history of modern Hong Kong, springing up as they did in the post-Second World War era when licences were issued to the relatives of dead or injured civil servants in order that they might make a living. These informal street restaurants boomed in the 1950s, but by 1956 licences were no longer issued due to noise and traffic complaints and the numbers began to dwindle. As licences cannot be transferred and the licence holder must be present at all times, you often see the elderly owner sitting by and relaxing while the younger generation toils way – anything to maintain that precious licence! There are now only 25 official dai pai dong left in the city, so be sure to enjoy a taste of this historical food culture while you still can. The food is typically traditional Cantonese, with enough variety to suit everyone’s tastes, from the fussy to the bravely adventurous. Culinary offerings include seafood, roasted meats, dim sum, stir fries, noodles and all manner of food on sticks, much of it infused with wok hei or ‘essence of the wok’, a distinctive, smoky flavour for which the dai pai dong are well known. There are some differences in the food available between daytime and nighttime carts. Cheaper treats, such as congee, rice and noodles, roasted meats, sandwiches and milk tea are common for lunch and during the day, while pricier ingredients such as seafood are more commonly found in the evening. One of the great benefits of this kind of informal, al fresco eating is the flexibility it affords. Not only can individual dishes be tailor-made to your preferences, you can also mix and match your ideal meal from the selection offered by the surrounding carts. Selecting and ordering from dai pai dong is an experience all by itself. Choosing carts that are crowded with locals is usually a good bet, but try to avoid eating between 12.30-14.00 if you don’t want to be completely swamped by hungry workers. Some menus in more touristy areas may have a little English, as can the owners, but otherwise pointing and gesturing is a sure-fire way to ensure you get fed. These iconic puffs of sweet egg batter, which look like huge bubble wrap, are crispy on the outside and soft and fluffy on the inside. Made in a dimpled, double-sided griddle, traditionally cooked over open charcoal flame, they are very cheap and best eaten hot and fresh. Great for eating on the go. Recommended: 59 Kat Hing Street, Tai O (still uses traditional charcoal) and Lee Keung Kee, 492 King's Road, North Point. These soft, fluffy buns are named after their sugary top crust which resembles the texture of a pineapple. Best served warm with steam rising from the bread as you tear. Available plain with butter or filled with fruits, custards or meats. Great for a quick breakfast or snack. Recommended: Canton Deli, 17 Canton Road, Tsim Sha Tsui and Kam Wah Cafe, 47 Bute Street, King Edward (crowded, but worth the wait). Think sweet, buttery dough cases filled with a lightly set, creamy, rich custard and you’re on the right track. 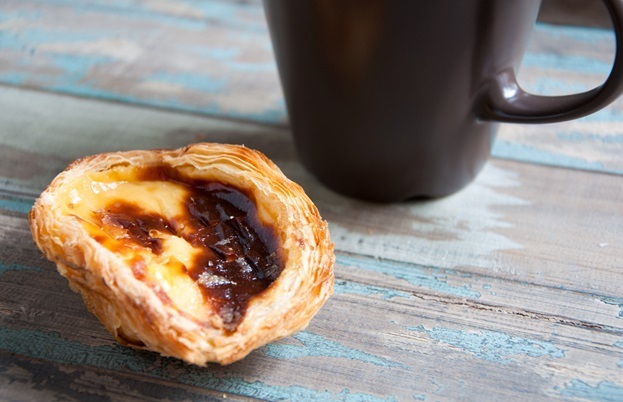 A legacy of Hong Kong’s colonial past, these decadent tarts are delicious warm and freshly made. Great for breakfast or eating on the go. Recommended: Hoover Cake Shop, 136 Nga Tsin Wai Road, Kowloon (uses duck eggs in the custard) and Mandarin Oriental Hotel’s Mandarin Cake Shop (for a luxury version). The most famous of all Hong Kong street food, these deep-fried balls of fish and starch are served on a stick, smothered in curry sauce. Great for a light lunch. Recommended: The island of Cheung Chau (specialises in larger, more fish-heavy balls). 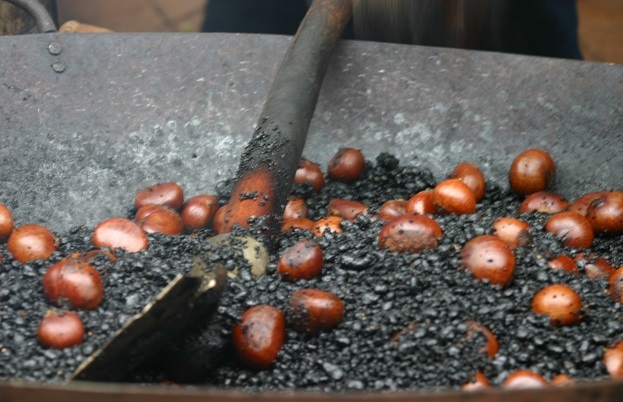 A feature of the Hong Kong autumn and winter, these healthy street food choices are typically prepared in the same cart – the sweet potatoes baked whole until searingly hot and steaming and the chestnuts slow-roasted in hot cinders. Great for a nutritious snack. 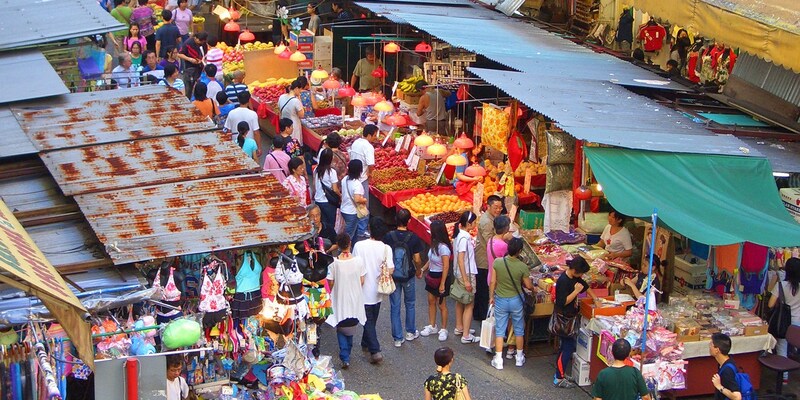 One of the oldest markets in Hong Kong, situated less than 60 metres from Queen’s Road in Central’s skyscraper district. Temple Street Night Market, Yau Ma Tei Some of the best street food in town can be found here, with a lively nighttime atmosphere and wide pedestrianised streets making for particularly good people watching. Mong Kok neighbourhood This area – the world’s densest neighbourhood and one of Hong Kong’s best entertainment districts – has stalls on almost every corner. Red barbecue pork is a particular speciality. Hau Fook Street, Tsim Sha Tsui Offering a wider range of food than is typical at dai pai dong, this nondescript street has options that span Cantonese, Shanghainese and Bejingnese cuisines.